For the past couple of years I have installed a window evaporative cooler that I bought on craigslist in one of the front windows. This year, however, that window has been replaced and there is not a new window that would fit the cooler. SO I had considered several other ways of cooling the house for the summer. 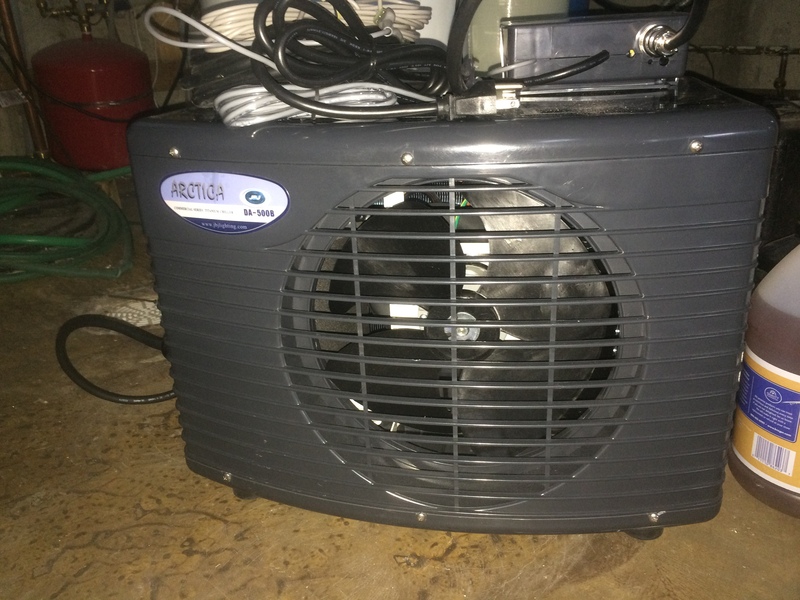 Installing a whole house evaporative cooler is one idea that was appealing but that would require ducting that is not the same as the ducting for the ventilation system. Evaporative cooling also wastes water–at least it has for the last couple of years as the tank dumps itself out every 8 hours. I also thought about running a mini-split air conditioner outside. These are heat pump air conditioners that run the cold fluid through copper pipes into air exchangers hung on the inside walls. They are 220 volt and would require more electrical outlets outside. I thought I might eliminate the air exchange unit and run the cooling fluid through a heat exchanger to cool the water in our radiant system instead but then I started reading about chillers. Radiant cooling was recommended by some friends of ours who know of a house that has it and say it works really well. I guess we are about to find out because after lots of research on aquarium chillers, I found a good sized one on ebay and bought it. 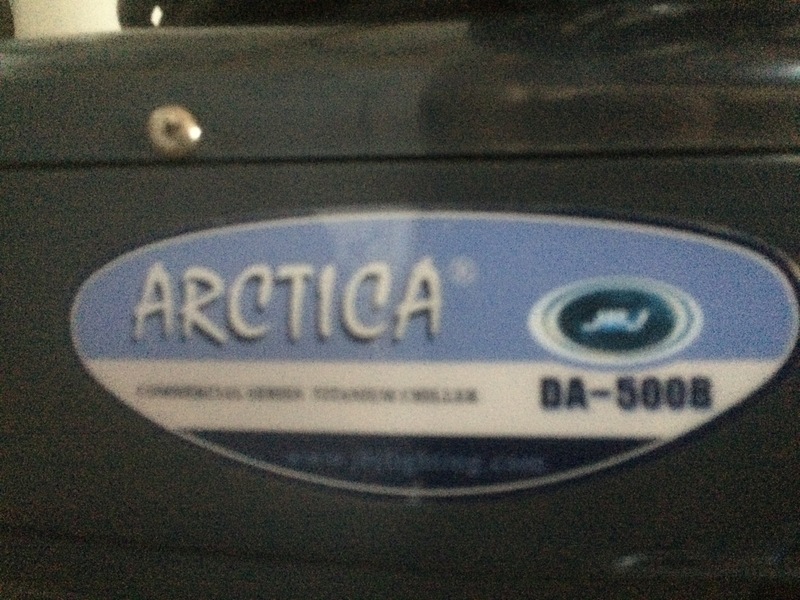 The unit was advertised as new and is the Arctica Commercial 115 volt 1/2 HP unit–model 500B. The unit did not have a controller included so I ordered one from Marine and Reef supply and was surprised when it shipped from Tempe, Arizona, our former hometown. R-22 refrigerant is a problem for LEED as there is a complicated formula that determines whether the amount of refrigerant used is a detriment to the environment. Energy efficiency can be a trade-off between the use of HCFC’s, electricity, or water. Since heat pumps also use R-22 and are beneficial as energy saving heat and cooling appliances, this chiller that only uses 5 amps when operating should balance the use of an HCFC. A typcial 1 ton air conditioner would use 10 amps at 220 volts or 20 at 115. So this unit uses about half of what a 1/2 ton air conditioner would use. Our Manual J calculations actually called for 3 tons of cooling, but I had not controlled for awnings on the solar exposed windows. I wrote the company and the unit is sealed with 1 lb. 4.5 oz. of refrigerant. 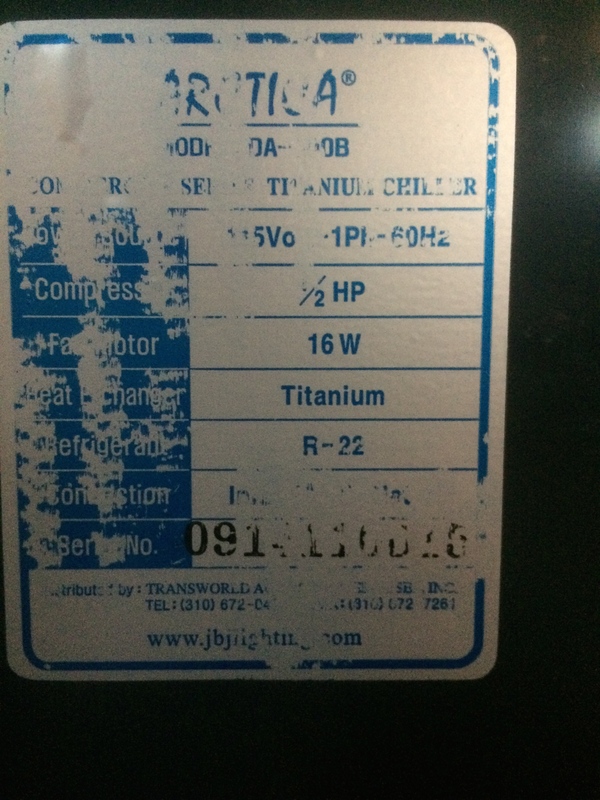 So like a sealed heat pump, it should not need to be pressure tested for LEED certification. This chiller is capable of cooling 150 gallons, more water than I have in the system with the 50 gallons of water in the old water heater, but the tank will lose cooling strength going through the exchanger so it will probably need the extra capability. It is rated at 6000 BTU’s which is “half ton” in air conditioners. The pump speed needs to be between 474 and 792 GPH which translates to about 8 to 13 GPM. 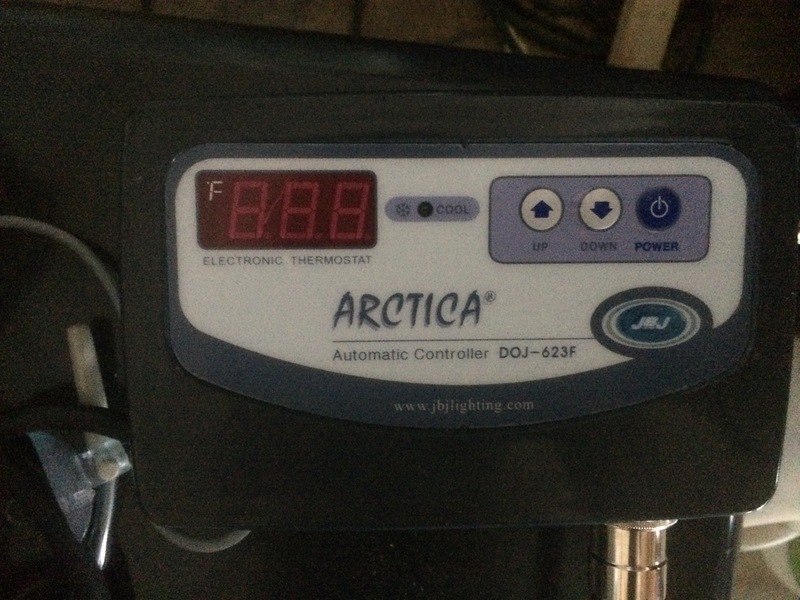 The controller temperature on this commercial unit can be set much cooler than regular aquarium chillers down to 32 degrees. I plan to tie this chiller into the storage tank for the fireplace boiler and run the chilled water through the same heat exchanger. 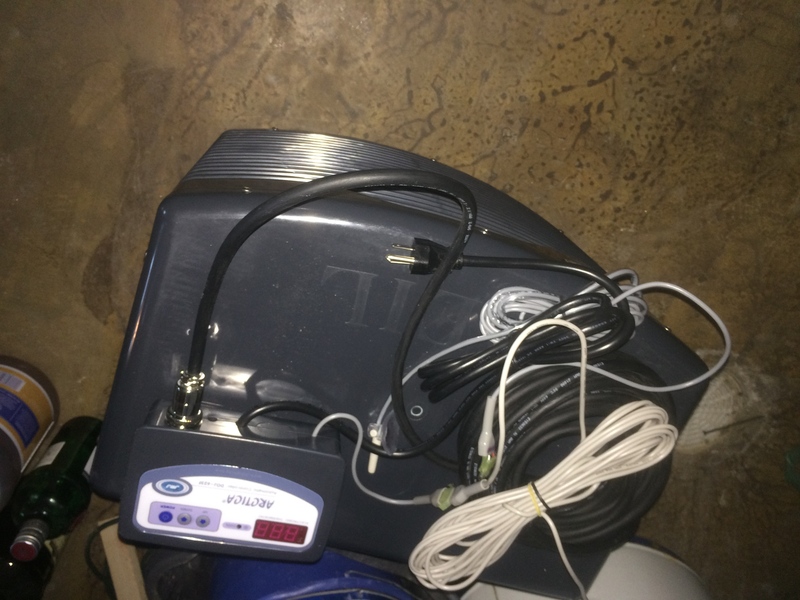 The thermostats will work on cooling mode and they should send the same signal to the valves to open and start the circulating pump on a call for cooling. I’ll use the same pump that is installed on top of the water tank to circulate the water through the chiller and the exchanger. Although I still have more work to do on the design. I hope I can get it set up before the weather gets really hot. It has been pretty cool so far this spring with a LOT of rain. This entry was posted in Appliances, Energy Efficiency, Radiant Cooling. Bookmark the permalink.